Delphin distinguishes between three types of application in vibration measurement technology: measuring absolute bearing vibrations, measuring relative shaft vibrations and measuring machinery vibrations. Delphin can provide a specific module (AMDT) for all types of applications for use in Delphin’s Message devices. 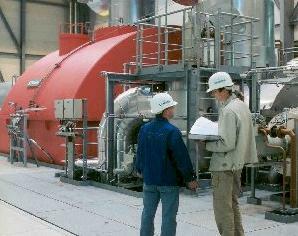 Monitoring/analysis of machine vibrations in roller plant. Using TopMessage hardware and the Vibrolab and ProfiSignal software provides the benefits of quality assurance, diagnosis/cause analysis functions, machine monitoring, and test bench and trial applications. Advice on choice of sensor (displacement, speed, acceleration) and appropriate signal conditioning (charge amplifier, ICP, converter). Message devices are recommended for use in TCP/IP network environments or for remote monitoring via a modem link. The devices can be allocated an IP address and linked into a network. Measurement data can then be analysed at any PC within the network. By combining various I/O modules, vibration and process values can be acquired within one system. Measurement, recording and monitoring of the static and dynamic movement of a journal bearinged, rotating shaft (fixed bearing housing). Turbines, compressors, super-chargers, large ventilators etc. Evaluation of peak to peak spp and maximum deflection smax according to VDI2059. Monitoring of static shaft position. Monitoring of dynamic shaft vibration. FFT analysis within device/frequency band monitoring. Speed measurement and triggering via impulse from rotating shaft. Process measurement values and vibration measurement values in one device. 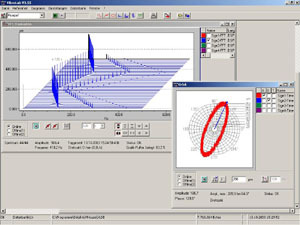 VibroLab for visualisation and analysis using time domain signal, trend, FFT spectrum, FFT cascade, orbit and polar diagrams. Measurement, recording and monitoring of absolute bearing vibration on machines with roller bearinged, rotating components. Electric motors, pumps etc. Evaluation of vibration strength veff according to DIN ISO 10816. FFT analysis in device/frequency monitoring. Evaluation using envelope curve frequency spectrum for bearing damage diagnosis. Monitoring and control of vibration level. VibroLab enables measurement values to be conveniently evaluated at a PC. Vibration data can be stored in a measurement value database for offline analysis. It is also possible to store data directly in the TopMessage device, without the need for PC support and to evaluate the data using VibroLab at a later point. If a link exists between VibroLab and the Message device (e.g. Ethernet TCP/IP), then online diagrams, monitoring, and analysis of data is possible.